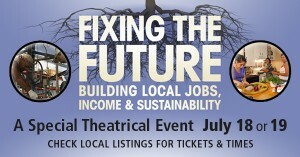 OwningOurFuture.com is co-hosting a special screening of the David Brancaccio film, “Fixing the Future” on July 18th in Boston. Based on his previous PBS series on the New Economy, the film features David Korten, author of the Foreword to Marjorie’s new book Owning Our Future: The Emerging Ownership Revolution. The film will be shown at AMC Lowes Boston Common the evening of Wednesday, July 18th – see further details below. It’s also showing around the country at dozens of other cities. Marjorie Kelly will be at the Boston screening, and David Korten will be at the screening in San Francisco. Boston is part of a growing national movement to reclaim our local economies. The New Economy movement is about more jobs, stronger local businesses and a healthier community. And you can be a part of this movement. On July 18th, find out how. Click here to RSVP on Facebook and tell your friends about it! In Fixing the Future, public media star David Brancaccio (of Marketplace and NOW on PBS) visits locations across America that are attempting a revolution: the reinvention of the American economy. By featuring communities using sustainable and innovative approaches to create jobs and build prosperity, Fixing the Future inspires hope and renewal amidst economic collapse. The film highlights effective local practices such as: community banking, local business alliances, time banking/exchange, worker cooperatives and local currencies. Following the film will be an exclusive onscreen discussion panel featuring Bill McKibben, Majora Carter, Mike Brady and David Brancaccio. 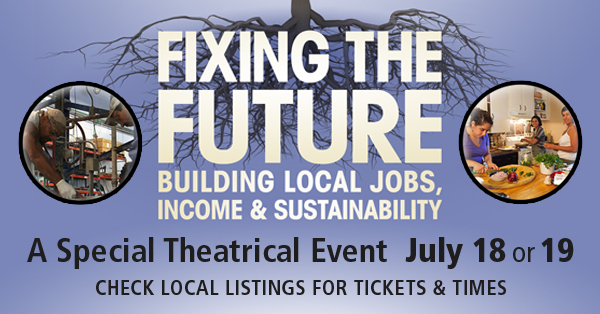 In Boston, Marjorie Kelly of Tellus Institute, along with co-hosts JP Forum, JPNET, Sustainable Business Network of MA will be there to talk about how you can get involved in efforts to reclaim our local economy.